The following chart describes the performance of the housing market in Blackhawk in 2011 versus 2010 through July. The single family homes have shown a decline in unit sales and marketing time is basically unchanged. A nice tidbit is the increase in the median sales price versus last year. Attached homes have shown a bit of weakness but the sample is small and can be subject to large variances on a month to month basis. The average days on market figures for 2011 are a little skewed since one of the sales was listed for 342 days. Real estate markets are local in nature and will perform differently. There have been several large estates sold with prices being withheld. In 2010 two homes sold which were listed for over $5,000,000. In 2011 there have been three sales where the listing prices were over $4,500,000. 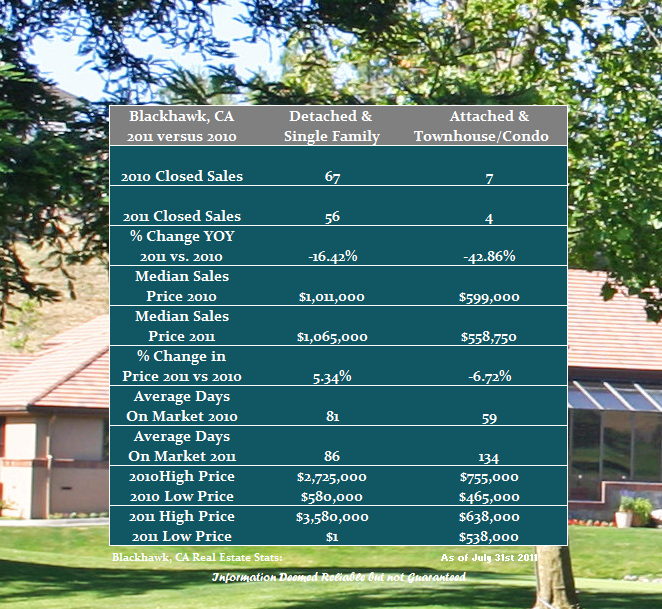 Share the post "Blackhawk Real Estate Market Year Over Year Report through July"